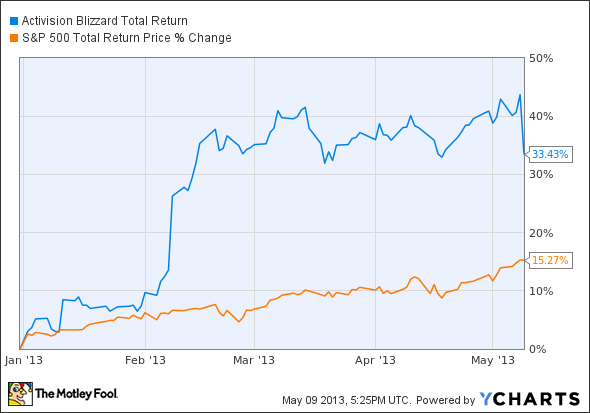 Should You Sell Activision Blizzard After Its Post-Earnings Drop? Shares of Activision fell nearly 7% after the gaming company beat earnings estimates. Here's what investors need to know. Shares of video game industry stalwart Activision Blizzard (NASDAQ: ATVI) fell more than 6% Thursday after the company posted better-than-expected earnings. ATVI Total Return Price data by YCharts. Would you be wise, then, to take profits now? Let's dig in to find out. Thanks largely to continued interest in each of Activision's key franchises, GAAP net revenue grew 13% from the year-ago period to $1.32 billion, crushing analysts' estimates, which called for just $704.9 million. GAAP earnings per diluted share rose 21% to $0.40, and adjusted earnings rose 183% to $0.17 per diluted share versus analysts' expectations for just $0.11 per share on the same basis. So why, exactly, is everyone so worried? Unfortunately, despite the strong start to the year, CEO Bobby Kotich stated "we now believe that the risks and uncertainties in the back half of 2013 are more challenging than our earlier view, especially in the holiday quarter." Apparently, Activision is taking a cautious approach based on a combination of a shift in the release dates of competing products from the likes of Electronic Arts (NASDAQ:EA) and Take-Two Interactive, a larger-than-expected 1.3 million subscriber decline in World of Warcraft players, and "continued challenges in the global economy." To be sure, the much maligned Electronic Arts, for one, is currently riding high after coupling its recent Star Wars win with a strong Q1 earnings report of its own. Meanwhile, we'll have to wait until next Monday to hear how Take-Two has fared. Even so, Activision raised its guidance and now expects GAAP net revenue to come in at $4.22 billion with earnings per share of $0.73, versus the company's previous estimates that called for GAAP sales of $4.085 billion and earnings of $0.68 per share. In the end, I can't help but wonder whether Activision is simply taking the "under-promise, over-deliver" route with Kotick's cautious comments. After all, he summed up his warning by saying: "Our focused and disciplined approach to our business has served us well in the past, and through continued investment and careful management of our costs, we expect to continue delivering shareholder value over the long term as we have for the last 20 years." Of course, there's certainly reason to believe him when he says Activision will "continue delivering shareholder value." As I noted back in March, the company likely has no qualms using its more than $4.6 billion in cash and investments -- that's nearly 30% of its entire market capitalization, mind you -- to the benefit of shareholders, especially considering it had spent $3.8 billion from 2009 through the end of 2012 on dividends and buybacks. What's more, Activision still dominates the highly lucrative core gaming markets with its enviable list of franchises including StarCraft, Diablo, Call of Duty, Skylanders, and World of Warcraft, which itself remains the world's largest subscription-based massively multiplayer online role-playing game with 8.3 million active subscribers. Skylanders and Call of Duty, for their part, were the No. 1 and No. 2 selling video game franchises in both North America an Europe last quarter, and StarCraft II was the No. 1 PC game in Q1, selling around 1.1 million copies worldwide during its first two days on sale. Needless to say, then, I'm convinced selling shares of Activision now will prove a terrible idea over the long run. Even after Activision's big year-to-date run so far, the stock still trades at just 14.1 times trailing earnings and 13.9 times next year's estimates. So while the folks at Activision may have their work cut out for them in the second half of this year, that doesn't change the fact their business will almost certainly remain massively profitable. When you combine that profitability with Activision's shareholder-friendly attitude, it's a safe bet patient investors will be more than satisfied with their returns going forward.